Acorn has the ability to open RAW files that are supported by Mac OS X. A list of supported RAW formats can be found here. When you open a RAW image in Acorn, the RAW Import Window will appear. 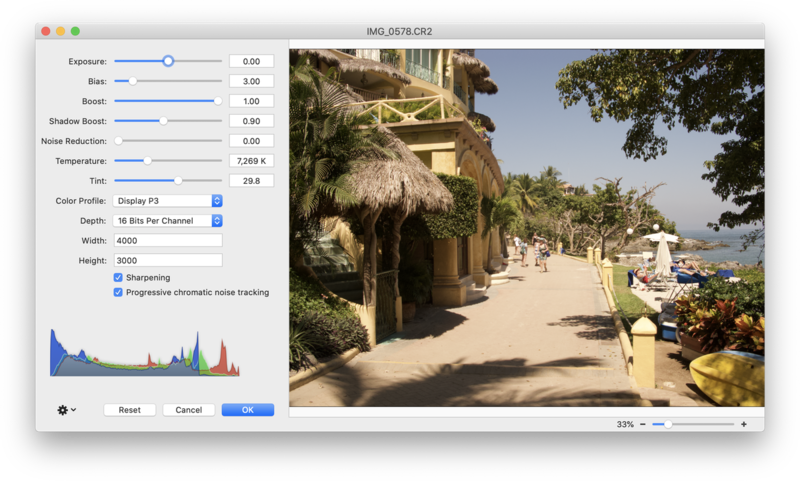 There are sliders for adjusting exposure, bias, boost, shadow boost, noise reduction, temperature, and tint. You can set the color profile, image depth, and the width and height. You also have check boxes to turn on and off sharpening and progressive chromatic noise tracking. At the bottom of the window is a live histogram of your image which updates as you adjust the sliders. If you decide you want to revert to the original image, you can click the reset button in the lower left hand corner of the window. Adjusting the exposure changes the lightness or darkness of your entire image. Increases and decreases in the amount of black in an image. Changes the brightness of the lighter areas of the photo. Changes the darkness of the darker areas of the photo. Decreases the appearance of random speckled dots in areas where color should be even. Changes the photo colors from warm to cool. Slides from green at the left to blue at the right. Various color profile options are available. Choose from 8 or 16 bits per channel. Gives a subtle enhancement to the edges in your image. Pressing OK will open your image in Acorn for further editing. When you save your opened RAW file for the first time in Acorn, a new file will be created. Acorn does not support saving RAW files.